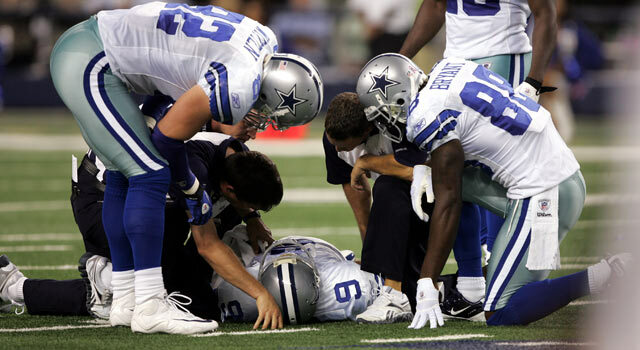 Published: March 3, 2011 at 05:41 p.m.
Poor pass protection resulted in the Cowboys losing Tony Romo for the season in Week 7. Will Dallas improve? So many of us who grew up watching NFL Films saw former Steelers coach Bill Cowher slobber as he admonished his young linebacker, Greg Lloyd, practically begging him to crash the pocket. The Steelers of the '90s won a lot of games with that basic motto on defense. Hurrying the quarterback never gets old, and it appears it's becoming a young man's game -- at least this year. 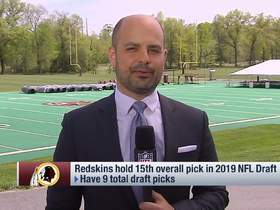 According to my NFL Network colleague, Mike Mayock, there could be as many as nine defensive ends taken in the first round of this year's draft, declaring it the best group he's ever seen. Considering there are only 32 picks in the first round, that's a huge percentage being devoted to one position group. Teams in 2011 aren't much different than Cowher's Steelers. They see the value in making life uncomfortable for the opposing quarterback. With a number of edge rushers entering the league, that puts an even higher premium on protecting the passer. If you made a list of the most misunderstood areas of modern pro football, pass protection would definitely make the cut. Let's explore ways to gauge how well a team protects its quarterback by examining a couple of teams whose seasons were destroyed because they couldn't. That would be Detroit and Dallas. Injuries to Matthew Stafford and Tony Romo put serious dents in the hopes of either team making a playoff push (although both clubs faced quite a struggle even with their starters). Bottom line, if you have a franchise guy, you have to protect him from the James Harrisons of the world. The Lions are an interesting team to look at when it comes to deciphering what is good offensive line play and what isn't. Fans, writers, and broadcasters often just factor in "sacks allowed" and call it a day. But from an overall standpoint, there is a lot more than that. Just for kicks, let's start with how the Lions fared at minimizing sacks (see chart above). Looks pretty good on the surface, right? I recently wrote about the issues confronting Detroit this offseason, and one mention of the inconsistency of the offensive line drew a few comments from readers who begged to differ based on the unit's 27 sacks allowed. But delving further into the numbers, you'll see a bit different picture. The Lions averaged a measly 6.3 yards per attempt, which ranked 29th in the NFL. What does that signify? Well, it means Stafford, Shaun Hill and Drew Stanton were completing a bunch of five-yard slants and none-yard outs, plays in which the offensive linemen didn't have to hold their blocks for very long. So how did Jim Schwartz's offense fare when it did take shots down the field? Not good. Detroit was 30th on deep throws (38.8 passer rating in 50 attempts), passes over 20 yards through the air, and had difficulty developing a vertical attack, throwing three touchdowns to seven interceptions on such plays. A big reason for the failure to throw deep was because the line couldn't hold its blocks long enough for the plays to develop. In fact, Calvin Johnson averaged the lowest yards per catch of his career last season (14.5). These numbers give a broader picture of the trouble teams have protecting their franchise passer. With all the edge rushers set to enter the league -- Clemson's Da'Quan Bowers and Purdue's Ryan Kerrigan, among others -- teams will to have to keep finding talented athletes that can block, as well as new ways to stop the bleeding. Even if teams are able to keep the quarterback off his back, too often the results are a bunch of dinks and dunks, simply because the line can't hold the fort long enough for seven-step drops. One team that doesn't dink and dunk is the Cowboys. Romo has a higher career yards per pass attempt than any other active quarterback (tied with Ben Roethlisberger at 8.04 YPA). But in order to push the ball downfield in coach Jason Garrett's offense -- which is really an extension of the "Air Coryell" system he learned under Norv Turner -- the offensive line must stay with blocks a second or more longer. It also means running backs need to be able pick up blitzers. That's precisely how Dallas got into trouble last season. For all the Cowboys fans who would like to get rid of Marion Barber, fact is, he's been a beast in pass protection. Take him off the field, and Garrett is rolling the dice on other guys to fill that role. That implies knowing protection calls and executing the assignments, something fullback Chris Gronkowski goofed up royally in Week 7 against the Giants. It resulted in Dallas losing its most important player -- Romo -- and any chance of getting back in the NFC East race. The illustration below shows how Gronkowski, a first-year fullback, left the backfield on a short route when he should have stayed home to pick up the blitzing Michael Boley. While Boley wasn't up on the line, he was definitely coming, making it Gronkowski's job to stay put. Felix Jones, meanwhile, was responsible for the strongside linebacker, had he blitzed. But since he didn't, Jones peeled off edge help to run a short route. In the base protection Dallas was running, the fullback's job is to pick up the weakside linebacker, which, in this case, was Boley. 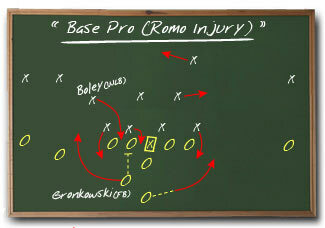 Had Gronkowski done so, the Giants linebacker would have met 245 pounds of fullback rather than Romo's ribs. The moment Gronkowski hit the sideline, running backs coach Skip Peete let him know that it was his flub that left Romo motionless on the turf at Cowboys Stadium. The replay showed Gronkowski stop as he was running his route, only to turn around and watch his assignment (Boley) rock his quarterback. Successful pass-protection teams have backs that know what they're doing, whether the protection is called in the huddle or at the line. A common mistake people make is assuming all audibles are geared towards changing the play when changing the protection call is every bit as important. While it's key that running backs pick up on the blocking change, it's equally important the quarterback and the line identify where the blitz is emanating from to make adjustments. Case in point: Baltimore failing to account for Troy Polamalu during the Steelers-Ravens tilt in Week 13. With Pittsburgh trailing 10-6 late in the fourth quarter, the All-Pro safety came completely clean on a blitz off the edge, pummeling Flacco from behind and forcing a fumble in the process. The Steelers recovered, and moments later scored the decisive touchdown. With all the quality defensive ends entering the league, and offenses potentially not getting to work on these kinds of issues with the potential lockout, protecting the quarterback will be critical in 2011. If you're wondering how well your team performs in said area, look beyond sacks. How many yards are they getting per throw? Are any of the receivers averaging more than 15 yards per catch? Can the starting running back block as well as Barber or, say, Clinton Portis? 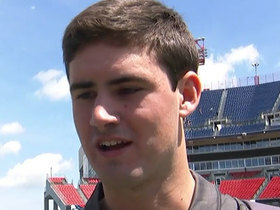 Maybe the most important question is how smart is your team's quarterback? The Packers got better once Aaron Rodgers became more decisive in terms of either getting the ball out of his hand, or taking off and running. The Super Bowl victory is proof of that. Talking pass rush is sexier than the protection it demands, the offensive line, or running backs who can block. And it will be all the rage when these defensive ends get snatched up come Day 1 of the draft. But make no mistake, pass protection -- all aspects of it -- plays as big a role in winning games as any other aspect. Just ask Stafford. Or Romo. Or Flacco.